What is the point of having a top end mountain bike without getting the suspension dialed in? I would rather ride a dialed in average bike than a top end undialed bike. As a lesser mortal rider, most of us do not have the skill to tune the suspension. The answer is the ingenious Bluetooth Suspension Tuner called Shockwiz. 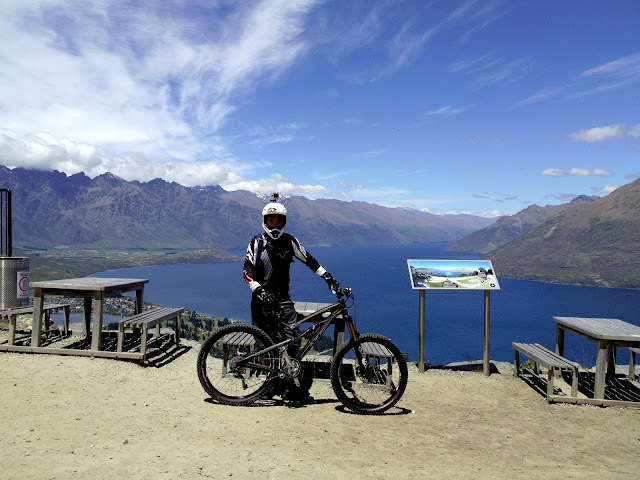 It all started by a mountain biker who launched the product via Kickstarter. SRAM saw the huge potential of Shockwiz and bought over the company. The standard Shockwiz now sell US$399 a piece. Take note that Shockwiz may not be compatible with some suspension models, do check Shockwiz website before purchase. Most Rockshox (obviously!) and Fox suspensions have no issue. Getting hold of Shockwiz in Singapore was a great challenge. At the time of writing this article, none of the local bike shops sell Shockwiz. SRAM Quartz USA told me that Singapore was not ready for the product due to regulation issue. As such, I ordered it from Worldwide Cyclery. The standard version comes with one rubber case, 2 cable ties, 2 air pressure cables (for shock & fork) and one Shockwiz. Refer to this video for installation instruction. 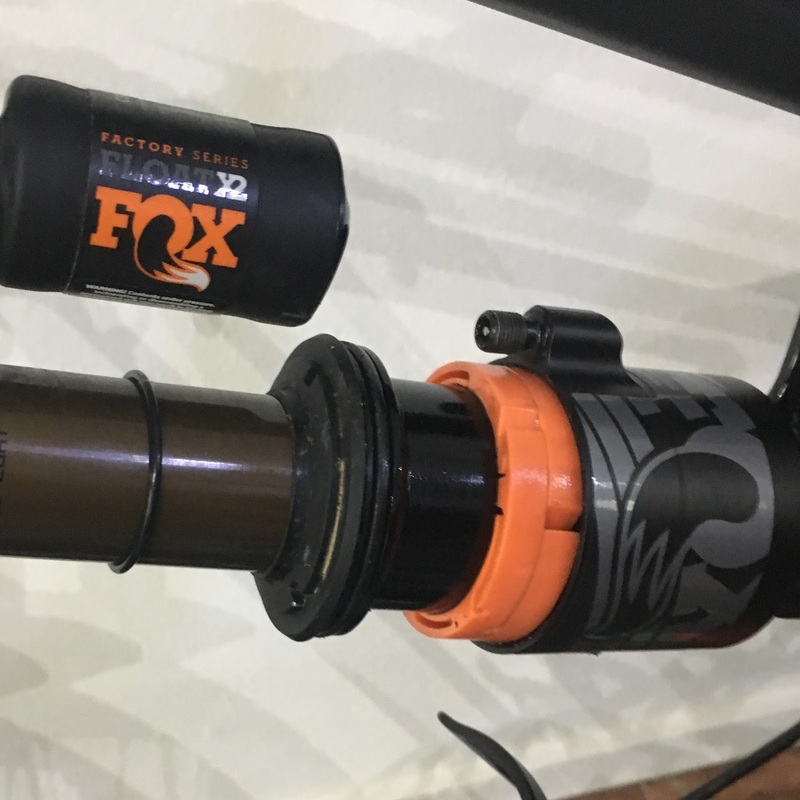 If you are using Fox X2 shock, be careful of the cable ties as the shock reservoir may rub on the cable ties when it is compressed. This is the most important step before any tuning can be performed. Absolutely no margin of error. Otherwise, your suspension will never be dialed in. Follow the calibration instructions on the mobile Shockwiz Apps closely. Watch the calibration video before you proceed. Shockwiz offers 4 differnce tuning styles: Efficient; Balanced; Playful; & Aggressive. The default setting is Balanced. Efficient is for XC rider, pure pedaling efficiency. Balanced is for trail & enduro riders, focus on control and pedaling. Playful is similar to Balanced except that it has more pop feel. Aggressive is for Downhill rider, super soft suspension. I chose the Balanced Style, as it gives the rider more control without compromise on pedaling efficiency. Besides, the setting is preferred mode for all-mountain & enduro rides. The tuning order should be ONE at a time, starting from the top to the bottom. After making ONE adjustment, start a new session and test ride again to check the reading before proceed to the next (if any). DO NOT adjust more than one setting at one go. 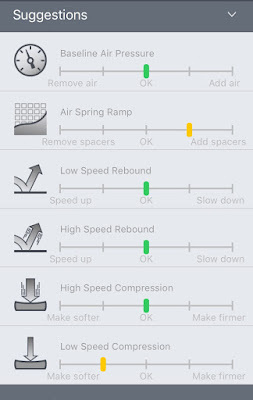 After removing one spacer from X2, Shockwiz suggested to reduce the pressure moderately. As such, I reduced the pressure from 151psi to 140psi, a reduction of 10psi. Managed to achieve 100% confidence at 96% Tuning Score! After 3 test runs, managed to achieve almost all green setting, except the HSC (yellow on the soft side). As the HSC on the X2 is at minimum limit, decided to leave it as it is. Does not affect the riding much. I have to say, the riding is so much plush and controlled than before. I am thrilled! The Fox 34 Performance Series does not come with compression adjustment. The only options available are Open, Firm & Lock. Based on my riding weight of 150lbs, pumped the fork pressure to 61psi and adjusted the rebound to +8 damping according to Fox recommendation (See above table - Before Tuning). After one test ride, managed to dial in the fork. The only adjustment is one click rebound on the slow side. No change on fork pressure. The Fox recommendation is spot one. After tuning, managed to achieve 100% confidence at 96% Tuning Score! The Fox recommended setting was pretty spot on, except for the spacer, rebound and HSC at moderate yellow. As the Fox Performance Series does not come with additional spacer, I am happy with the final setting, after adding one click to damp the rebound. 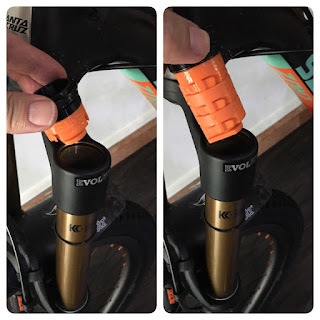 Riding the tuned fork on many different trails and one common suggestion was to add volume spacer into the Fox 34 fork. Got the spacer from KH Cycle for SG$8 a piece. Since Shockwiz suggestion was moderate yellow, added one volume spacer together with the existing 2 spacers. Total 3 spacers on my Fox 34 fork. Re-calibrated the Shockwiz and pumped the fork to 50.8psi. The compression ratio changed from 1.8 (2 spacers) to 2.4 (3 spacers). After riding a few runs on my local MTB trails, the final setting of my Fox 34 settings are as follows. Managed to get green for Air Spring Damping after adding one volume spacer, but sacrificed on the HSC. As the Performance Series does not come with compression adjustment besides the 3 settings (open, mid firm), have to live with it as long as it is not fall in the red region. One month ago ordered a 2018 Fox 36 Factory Series 160mm fork from a LBS. As usual, our LBS always late in the game. Wonder when will the fork arrive. Look forward to install it on my Santa Cruz Hightower and get it dialed in again! Upgarded my Hightower fork to 2018 Fox 36 Factory Series. Transfer the existing Fox 34 fork to my 2018 Chameleon frame. The new Fox 36 offers more option for tuning, such as LSC & HSC. After numerous rides at BT and Chestnut mountain bike trails over one week, Shockwiz suggested adding more tokens; remove air pressure and softening LSC & HSC. As the new fork comes with one token pre-installed by factory, I added another 2 tokens and reduced the air pressure from 70psi to 50psi. However, Shockwiz still suggest to add more token. As I did not experience bottom-out and would not want to ride too hard, decided to stay put at 3 tokens. The fork setting is listed at FINAL SETTINGS. 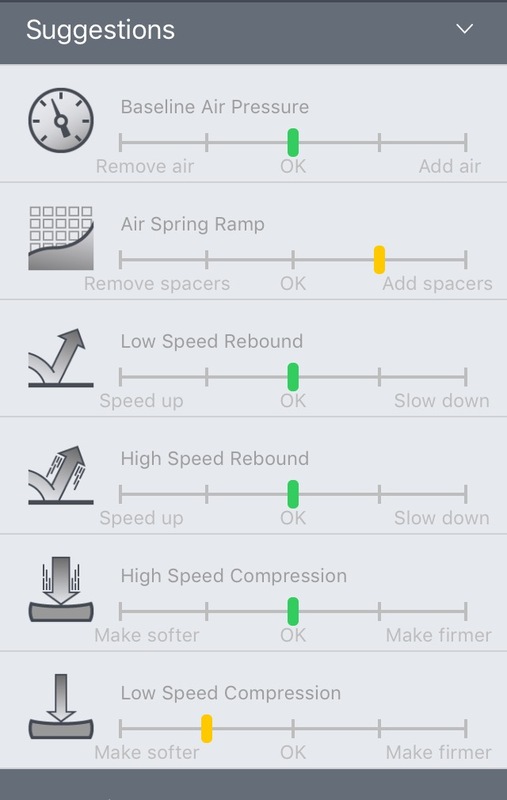 I realized the Shockwiz suggestions changes according to the way you ride and the types of trails you ride. Did a measurement on my average speed, top speed and maximum heart rate before and after tuning my shock/fork with Shockwiz. Great improvement after the suspensions were tuned. Rode the same BT trail, my average speed improved from 10.9km/h to 12.2km/h; maximum speed increased from 29km/h to 32km/h; and maximum heartbeat reduced from 177bpm to 162bpm. Shockwiz is a tool that make us aware of how the suspension system works and what we should adjust to make it suit our riding styles. Forget about getting all green scores all the time, you will never get it as the reading varies according to the way you ride and the types of trails you ride. What you want to achieved is to be aware of your suspension setting, and get your suspension dialed-in as close to your riding style as possible. Make adjustments as your riding styles change or the trails you ride varies significantly from your usual trails. My average speed and heart rate improve significantly after the fork and shock are dialed in. What more can I say? What is the point of owning a top-end mountain bike without getting it dialed in? I am thrilled how Shockwiz empowered rider to tune the suspension according to their preferred riding style. The Shockwiz does not come cheap, many riders chose to pool in money to share the cost. Others prefer to rent. For me, Shockwiz worth every single cent especially when you own a top end mountain bike. Moving forward, I will leave the Shockwiz permanently on my fork so that I can tune it according to the types of trails and my riding preference. If I can get hold of a used Shockwiz, will install it permanently on my X2 shock too. Look forward to my next ride! Hey Chris, nicely written article on the ShockWiz, and it provide me a very detailed understanding on what it does, how it helps and whether I should invest in 1. Great job and keep up with all the brilliant articles! Hi Antz, thanks for the good words. Glad that the articles help. Cheers! Would you consider renting your shokwiz? I woulb be keen as i live in singapore. Hi Matt, I am now based in Auckland. Sorry unable to help. Fantastic information. Thanks for putting the effort in writing this. Pushed me over the edge to buy two of the units!